Twelve great monthly calendar templates for elementary students. There is a template for each month of the year. Add these calendars to your math time and teach your students math skills around days, weeks, and months. There are plenty of squares to fill in dates, holidays, and birthdays. Older students can fill in homework, holidays, and activities during the month. 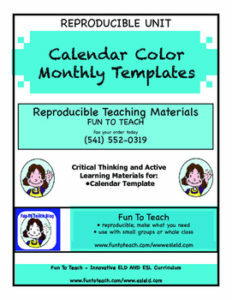 Print these calendars to help your students get more organized in their life and activities. Teach students to keep track of events with calendars. -At the beginning of each Month have your students fill in the calendar with numbers, special days in the month and holidays. -Decorate the calendar according to the month. Turkeys for November, hearts for February, etc. Each day have students fill in the worksheet page. Print calendars then place them in a sheet protector for use. Write on, wipe off and hang anywhere.